So, in the middle of the night, Tim hops out of bed, pulls his boots on and slips out into the farmyard to look for him. The hens in the henhouse haven't seen Ted and neither have the cows. Before long, Pacer the horse, the ducks, the goats and the sheep have all joined the torchlit hunt for Ted, but it is only when the motley search party reaches the pig sty that Tim finds out where his beloved toy has been hiding. This wonderful story of a torchlit midnight adventure, within the comforting surroundings of Tim's grandparents' farm, will thrill children and is perfect for reading aloud with its rhyming, rhythmic text. Russell Ayto's quirky illustrations are packed with a zany cast of animal characters and gather pace with the story perfectly. 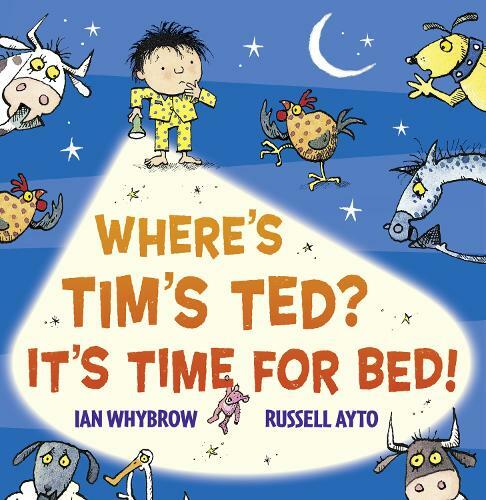 Where's Tim's Ted is the perfect bedtime reader for the very young, but with its rhyming text it's also a natural for slightly older children, who will begin to recognise the correlation between the words on the pages and those in their memory each time they hear it.